Startup Show: Best Networking Event, How We Can Continue. Startup Show each Friday at noon, Mountain Time. Startup Show right here tomorrow: Internet and Elections, Temporary Grassroots Tool? Startup show is right here tomorrow, probably with a link to YouTube Live again, didn't have much luck with alternative service we used last week. Our topic will be the Internet and Elections, what's happening now and what might happen if worst case scenario comes true, whoever is elected restricts our ability to contact each other on the Internet. To be a guest on the show call (303)861-1447. Or just come back here at noon tomorrow or any Friday at noon Mountain Daylight Time or see us on YouTube Live Events. Save the Caucus! www.GrassrootsRules.us and www.COCaucus.org, soon NM, WY, UT, IACaucus.org: Love Colorado? 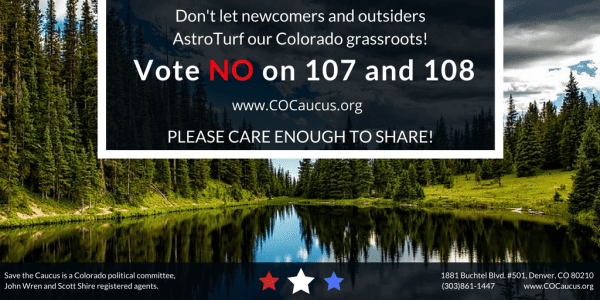 Save our grassroots! PLEASE SHARE!